The Municipal Theater sits at one end of yet another grand boulevard, Le Loi. Walking away from the front of the theater just one block will bring you to an intersection with an equally big street, Nguyen Hue. 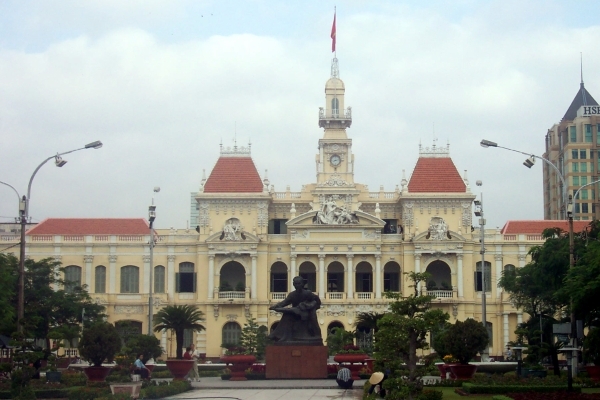 Just one block up to your right, sitting at the end of Nguyen Hue Boulevard, is the People's Committee building, formerly the Hôtel de Ville or city hall of Saigon. The building is modeled on Paris' own Hôtel de Ville and was completed in the early years of the last century. In the small park in front is a statue of Ho Chi Minh himself. On one corner of the intersection of Le Loi and Nguyen Hue Boulevards is the Rex Hotel, where US Military officers stayed during the war. The hotel has been fully restored and is one of our recommended hotels.